After five rounds in four states of high-flying dirt bike action featuring the best racers from Australia and the USA, the 2017 Australian Supercross Championship is all set to play out its grand final this Saturday night, November 18, at Jimboomba X-Stadium in the City of Logan Council region of south-east Queensland. With both premier SX1 (450cc) and SX2 (250cc) championships to be decided at the event, Jimboomba X-Stadium is set to be packed with race fans eager to witness another spectacular night of dirt bike competition at the popular venue, which played host to the opening round of the series in September. 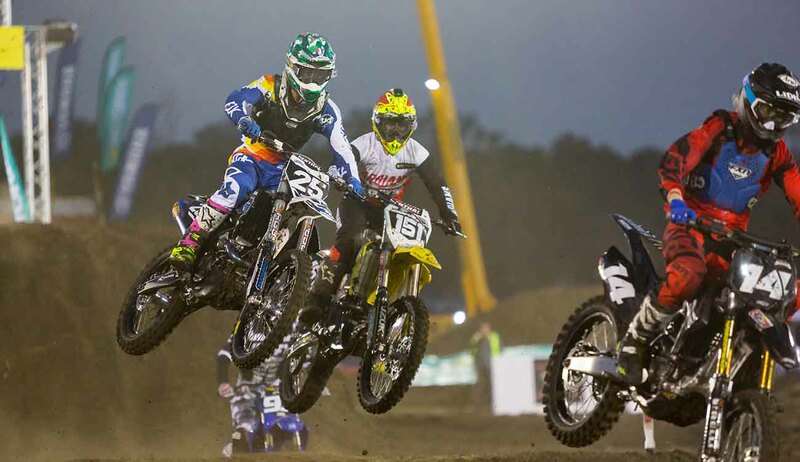 “Jimboomba X-Stadium is set to explode this Saturday night as the Australian Supercross Championship grand final is going to be huge!” enthuses event organiser Scott Bannan. Bannan is set to revamp the Jimboomba X-Stadium track design for the grand final, with a new lay-out featuring both north-south and east-west track lanes, giving fans on all sides of the venue a feast of viewing options. The popular elevated start line continues, as does the testing sand pit section. In the SX1 class, defending champion Justin Brayton (Penrite Honda Racing) enjoys an 18 point advantage in the series standings after snaring a third place finish behind countrymen Jason Anderson (Rockstar Husqvarna) and Dean Wilson (Rockstar Husqvarna) at Sunday’s round five in Sydney, which came after Brayton’s aspirations were thwarted the night before by a first turn pile-up in the Final at round four. “The first night at Sydney last weekend was tough to accept,” Brayton explains, “as I felt confident and had good speed, but the first turn crash in the Final on Saturday night left the bike a little twisted and I rode as well as I could to finish eighth and salvage some points. Brayton, who swept all three opening rounds of the championship in dominant fashion through September and October, leads Australian stars, Logan local Dan Reardon (Mega Fuels Monster Energy Kawasaki) and Dean Ferris (CDR Yamaha), who are split by just two points as they continue their contest for top-Aussie status. In the SX2 category, defending champion Jackson Richardson (Serco Yamaha) now makes the front running after last weekend’s double-header in Sydney, which saw Wilson Todd (DPH Motorsport Yamaha) and new American invader Chris Blose (Penrite Honda Racing) split the round wins in two nights of knock-down, drag-’em-out indoor supercross competition. Just five points seperate Richardson and Todd in the SX2 championship standings, with the battle set to go all the way to the wire. “It’s awesome to get the points lead after the Sydney weekend but with only five points in it, there is no time for rest,” number one plate holder Richardson admits. While Richardson and Todd will be immersed in their own battle, American rider Blose is set to be the spoiler in the SX2 pack, as he is staying in Australia to race at Jimboomba, filling in on the Penrite Honda squad for injured fellow American, Gavin Faith, who is a former multiple Australian champion. Advance purchase tickets to the Jimboomba X Stadium grand final round of the 2017 Australian Supercross Championship – which will feature an afternoon Pit Party where fans can meet their favourite riders – are on-sale via the www.ticketbooth.com.au web site. General admission, Stadium seating and discounted Family Pass tickets are available. For all further event information and latest news updates, be sure to regularly check out the www.jimboombaxstadium.com.au web site and follow Jimboomba X Stadium’s accounts on all popular social media channels.